First post of the year for me! In the background I have my Xmas present, a book on beer and food pairing. My goal this year is to cook dinner and pair a beer with it hopefully once a week. Right now, I cook zero meals a week, so it remains to be seen if I can actually pull this off, but it's worth setting the bar high. 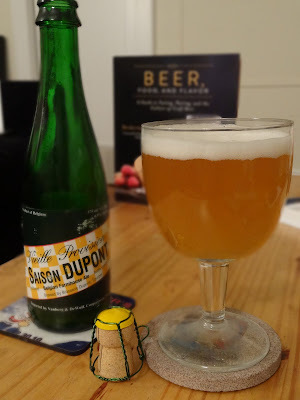 Saison DuPont is a world famous beer for the style and I'm surprised that I haven't tried it before. It's a breezy 6.5% and it's brewed in Troupes Belgium. After liberating the beer from the fridge, I pour and let it warm up to optimal temperature. When I return several minutes later, the head is still full and gorgeous. Pours a hazy light golden. Strong yeasty, earthy aroma, and like the scene it Ratatouille with the curmudgeon restaurant critic, it takes me to what I imagine a farmhouse is like. The intense aroma contrasts with the a subdued first 'attack,' which is light but full of flavor. It's incredible. The aroma and thick head leads you to think it may taste like a triple or a full bodied hefeweisen, but under this belgian lace it's an easy drinking, smooth and satisfying. The body is thin, but it almost seems to grow thicker, fuller with a punch of spice that hits as you finish. It's almost as easy as drinking a commercially produced beer like Shiner Blonde or Goose Island 312 - almost. But there is fantastic complexity. The aroma is bold, grassy, citrus but underneath, it shows a softer side. Slightly sweet, slightly tart, with BURSTS of citrus and honey. It's a fantastic nectar of the gods.